What a great way to end the season!! At no point was I expecting to receive anything at the St Mary's Richmond Athletic prize giving today as I only managed to grab 2nd spot (or 3rd depending on Neil Jennings' performance at the decathlon this weekend) on the club's overall men's top performance list (Just missing out to Paul Derrien and his string of wins in hammer and discus) plus I missed out on the highest scoring individual performance (Awarded to Mervyn Glover for his excellent 1.92m High Jump), and when my name was called out you can imagine the surprise.. 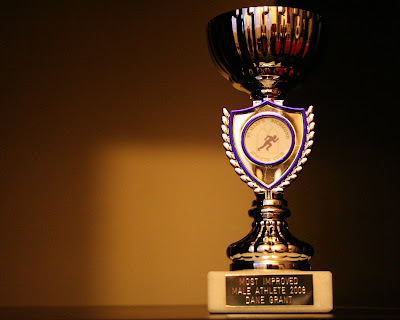 The trophy was for "Most Improved Male Athlete 2008", as it is my first season at the club (and back at athletics after a long break). I also picked up a medal for being part of the team who became the "Rosenheim League Western Division Winners 2008".